For my 50th birthday, my wife and I drove through Alberta and British Columbia. You can start at the beginning here... or read the whole series as an eBook with extra content! - Inigo Montaya, "The Princess Bride"
We woke up at a reasonable hour (7:30 AM or so) to start our short drive from Golden, BC to Banff to continue my 50th birthday trip. It's a mere 139 km drive, only an hour and a half assuming no interruptions for construction or traffic... and we had the whole day to do it in! Naturally I had factored in some train watching time, so I expected to take a lot longer than 1.5 hours to travel that distance. We left Golden and headed east on the Trans-Canada. There's some pretty scenic country along that stretch of highway, and the CP main line flirts with both the highway and the Kicking Horse River. Unfortunately, there were no trains running when we drove past, and even if there were, the tremendous amount of road construction would have made it hard to pull over to get a shot. We arrived at Field. This little town is a division point between the CP Mountain subdivision to the west and the CP Laggan subdivision to the east. Trains stop here for a crew change and it's not unusual to find a train or two stopped any time you drive by. 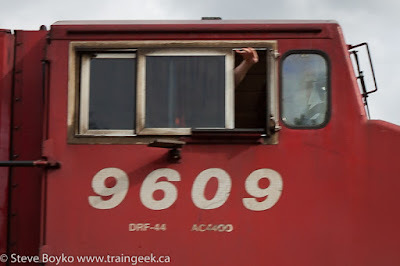 This time was no exception, with CP 9609 East stopped by the former telegraph building. They were not parked in a very photogenic location, especially with the sun not really showing its bright face, so I tried a few different angles to try to get a better photograph of this grain train. We ended up sitting here for about an hour... thank my patient wife, as usual. It seemed obvious that they were waiting for a meet. I don't know who Woody is, but he's all over this locomotive. 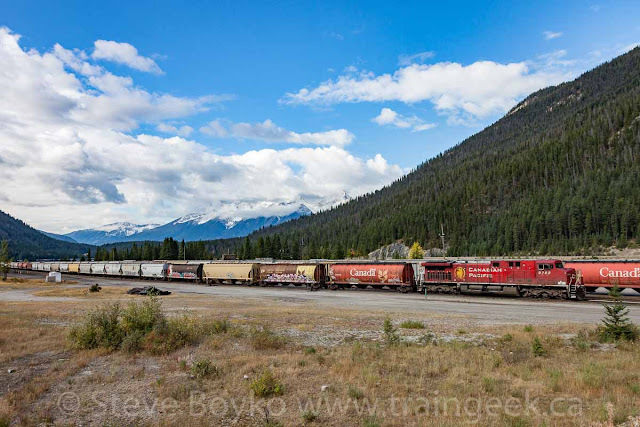 It turned out that there was another eastbound grain train coming, and it stopped at the former station in Field. CP 9782 was at the head. But CP 9609 wasn't waiting for that train... it was waiting for CP 8554 West. CP 8554 came rolling into Field. I patiently waited for CP 8554 to come out of the shadows and into the sunlight to get the shot. It's a pretty nice view here! 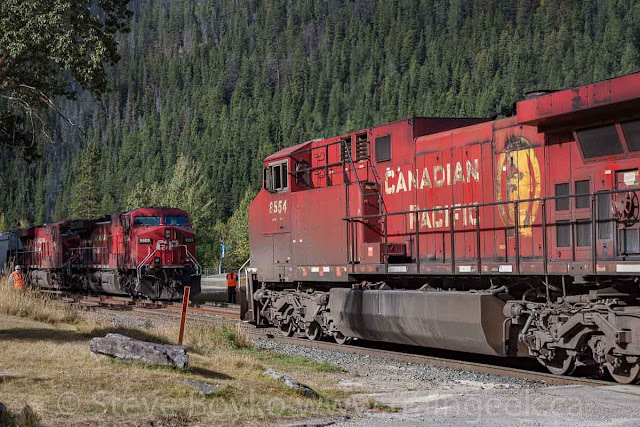 They rolled through the crossing and met CP 9609 and its crew, on the ground for the roll-by inspection. That golden beaver on CP 8554 is looking pretty ragged! 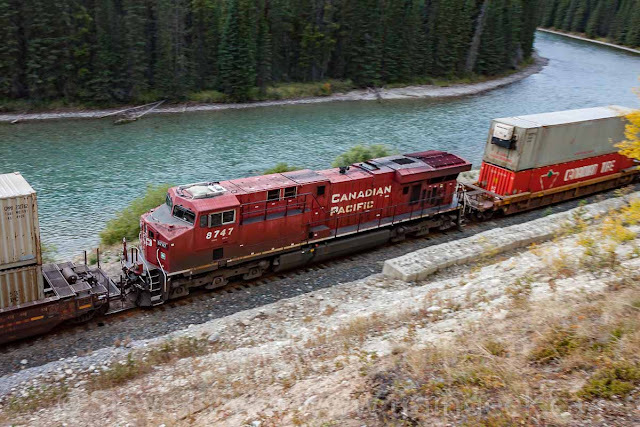 Even the end unit, CP 9355, looked pretty good. We hit the road after CP 9355 passed by. I assumed CP 9609 East was going to head out right away so I wanted to get ahead of it. 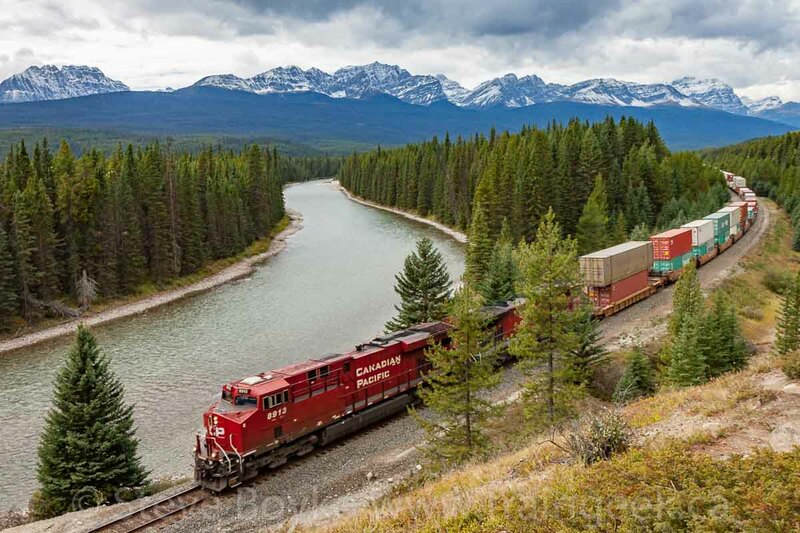 Arguably the most famous railway attraction in Canada, or least the Rocky Mountains, the two spiral tunnels replaced CPR's "Big Hill" and replaced the perilous 4.5% grade with a more manageable 2.2%. 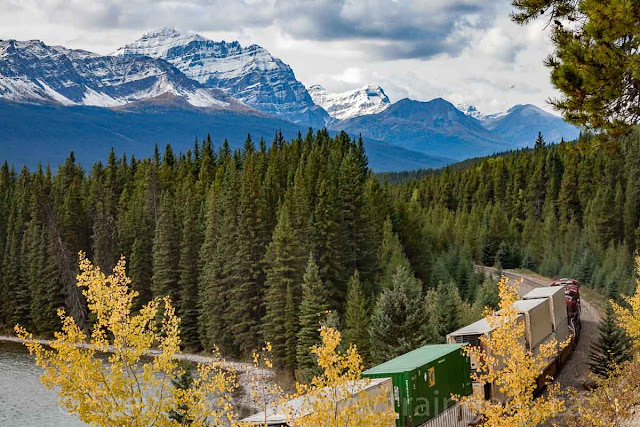 There's a viewpoint along the Trans-Canada Highway where you can view both portals of the Lower Spiral Tunnel. We parked there and went to see if CP 9609 East had caught up to us. I could hear it, and by the time I fought my way through the crowds to get a view, I saw the DPU (CP 9653) far below. 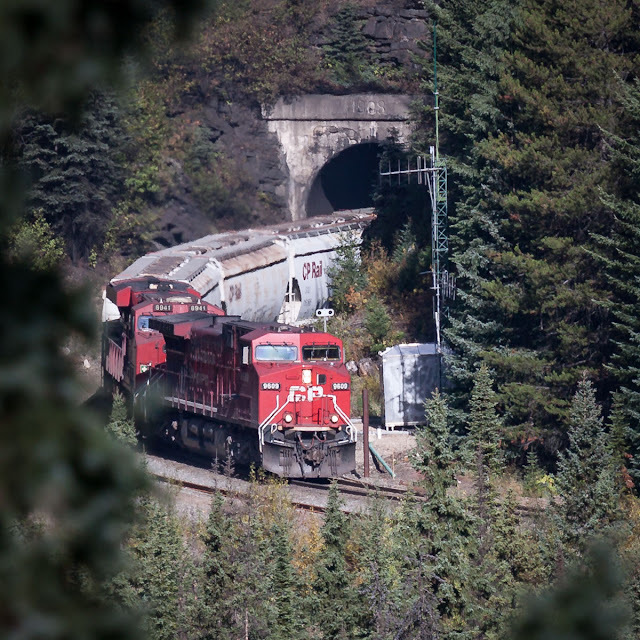 Less than a minute later, the lead locomotive popped out of the upper tunnel portal. The photo above is heavily cropped from a 200mm shot from quite a distance away. To right is the same viewpoint, at 85mm and uncropped. I'm frankly impressed that it is as sharp as it is. Note the "1908" at the top of the portal. The Canon 70-200mm f/4 lens is a good one! Soon the train looped over itself... not that you can really see it any more. 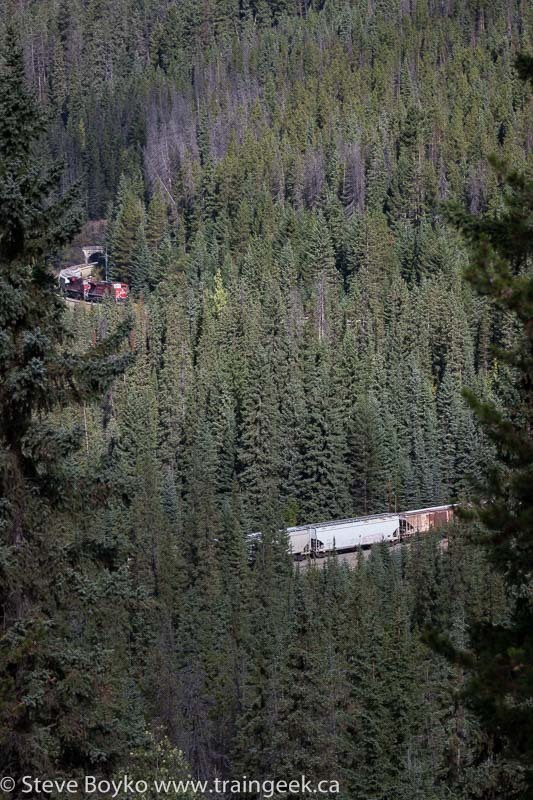 The area is so overgrown that you can't even see the lower portal, and when trains leave the lower portal heading east, you can catch glimpses of the train through the thick tree growth but that's it. Parks Canada is really dropping the ball here on maintaining this site. 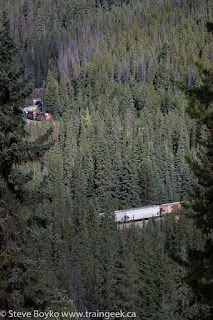 Like Morant's Curve, it's up to them to maintain the trees and cut them back where required. If this keeps up, in another decade there will be no point in stopping here as nothing will be visible. We didn't wait for the train to finish going through... I wanted to try to catch it at Wapta Lake like I did the last time I was in the area. Sadly there was a ton of road construction by the lake and there was no place to stop. The light wasn't great anyway, so we carried on. 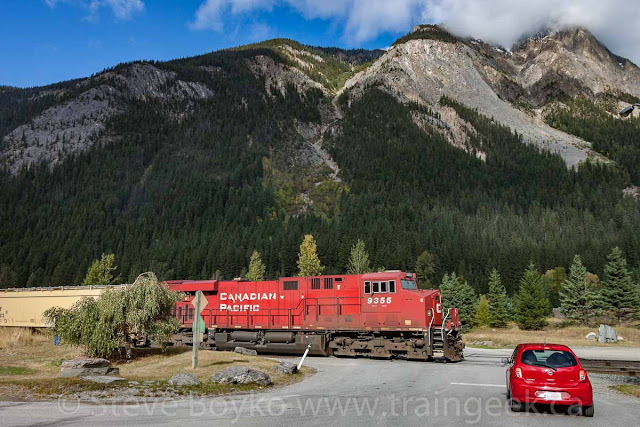 We wanted to visit Moraine Lake after we caught this train, so we kept going to the Lake Louise exit. There were a lot of cars around, and there were people directing traffic at each 4-way stop. That was a first in my experience! We went straight to the old Lake Louise station - now a restaurant - and I waited by the display cars for the train to come along. 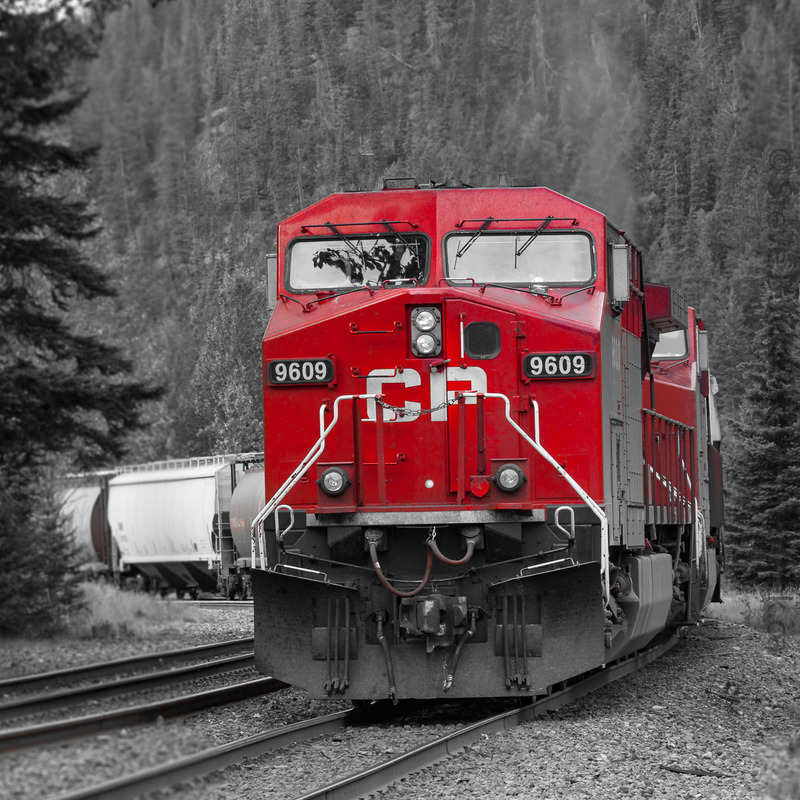 CP 9609 came storming around the corner. She put on a lovely show and sounded great as the train rolled on by the station. Nice wave from the engineer! 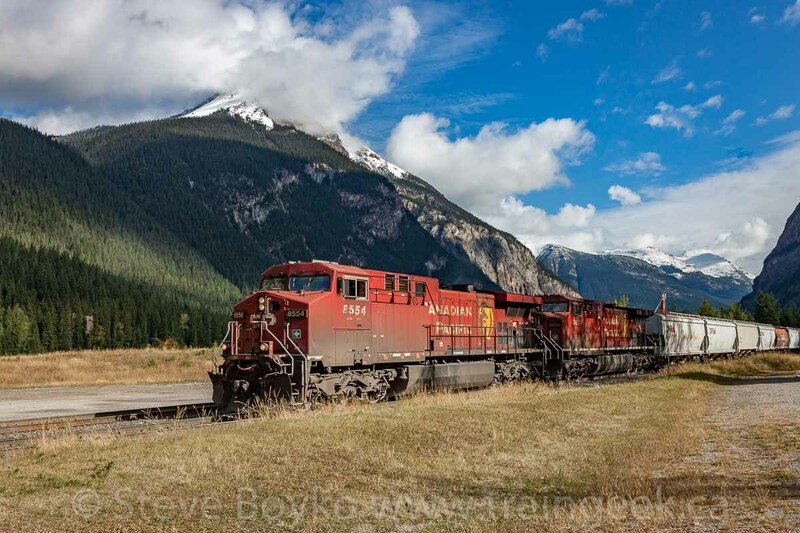 For those who care, I believe the train took a few minutes less than an hour to run the 20.4 miles from Field to Lake Louise. We left the chase off here and went to Lake Louise proper. 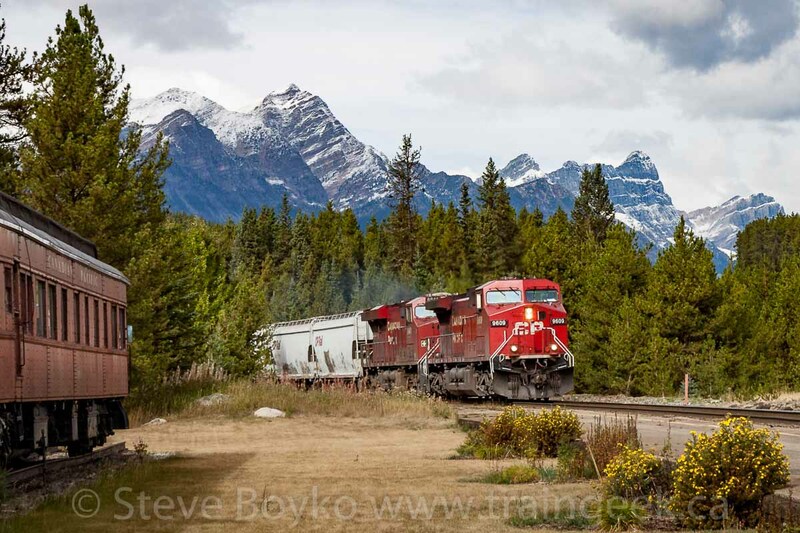 Or, I should say, we tried to go to Lake Louise. There were so many people around that there was no place to park and they were turning everyone away. Our alternate was nearby Moraine Lake, which was also full. There was overflow parking with a shuttle bus, but it was already well after lunch time so we decided to give it up for the day and come back early the next day. Apparently this was a great "fall foliage" day and everyone was out to try to see it one last time. It was a nice warm day, perhaps one of the last for the season. The free admittance to national parks as part of the Canada 150 celebrations probably helped, too. 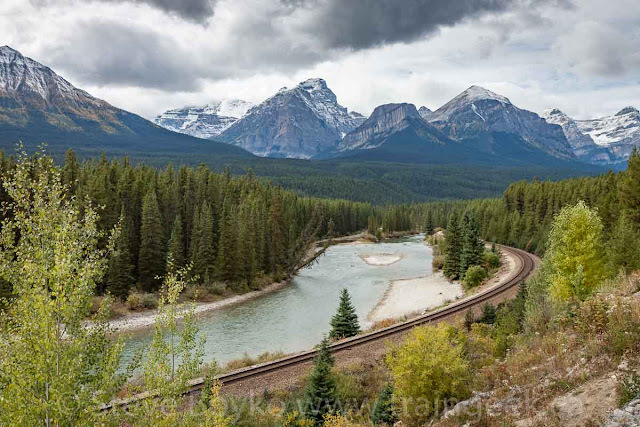 Anyway, we headed down the Bow Valley Parkway aka Highway 1A aka the long way between Lake Louise and Banff. 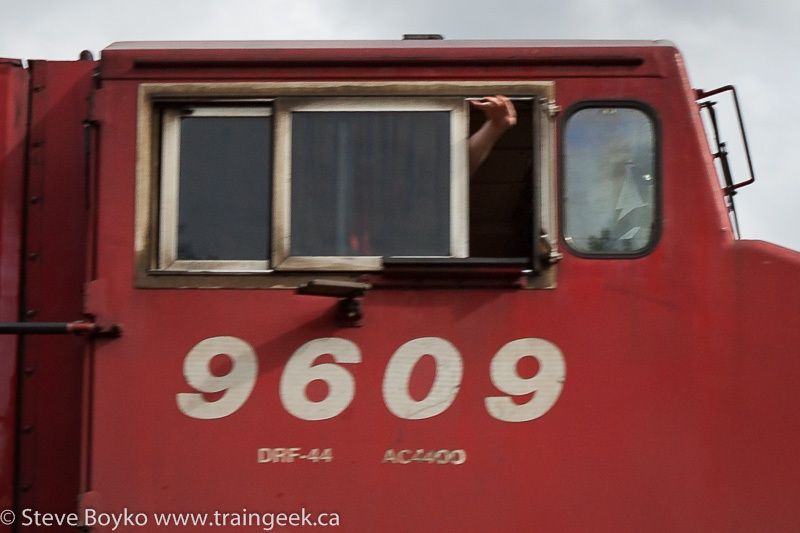 I wanted to see if there were any trains and my wife wanted to see wildlife. We stopped briefly at Morant's Curve. There were the usual collection of photographers there, but we didn't linger too long. I stayed for about 10 minutes, taking a few photos and chatting with a professional photographer there. He was hoping to catch a train and we talked angles and exposures and composition. Fun! I really wanted to try a different location this time - Castle Mountain. 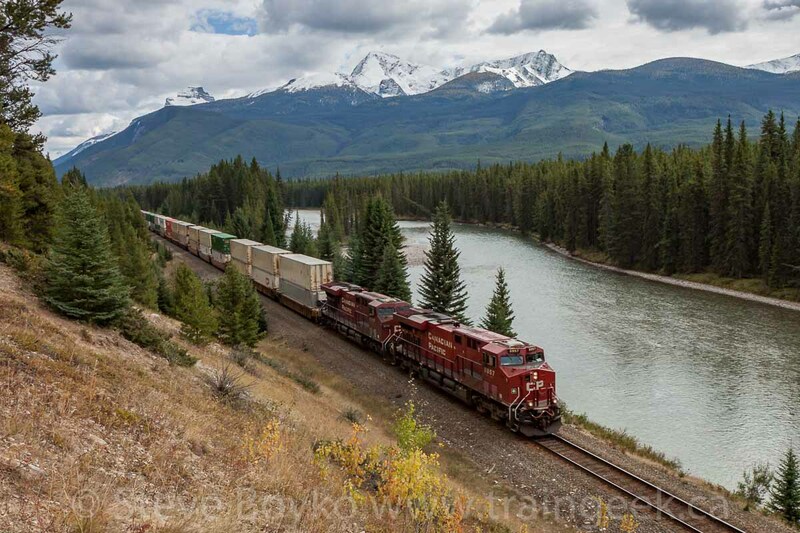 There's a rest stop close to Castle Mountain that overlooks the Bow River and, more importantly to me, the CP Laggan subdivision. It's here and it even has a bathroom! I parked here and then went to scout angles and set up while my wife waited in the car. You can see that it's pretty scenic! There's a nice curve to the west and a straight section to the east. A path leads across the top of the slope so you can get around pretty easily. I wouldn't say you can get very close to the track without clinging to the side of the hill and/or being too close to the tracks for safety. After about 35 minutes, a train came along... from the west. After 8913 and 8608 rolled by with their train of containers and autoracks, all was quiet for another half an hour. 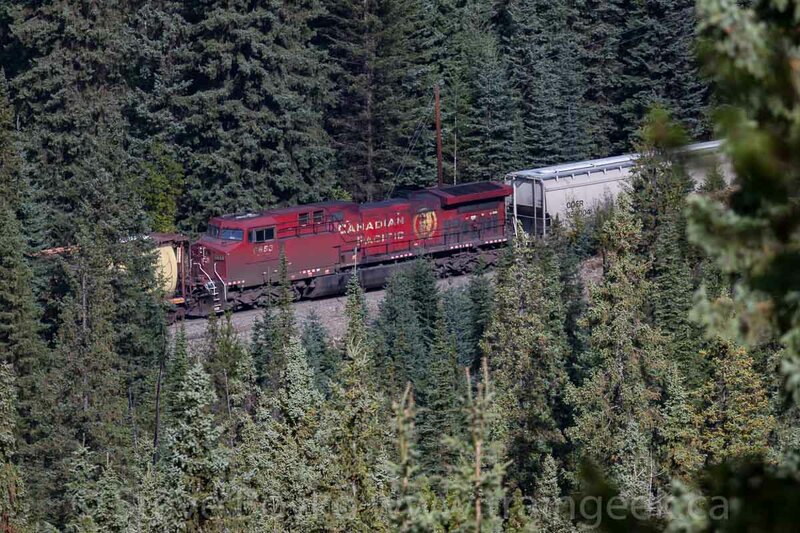 Eventually I heard a train coming from the east and set up to record CP 8957 West, another intermodal train. The lighting was a bit challenging, since it was 3:30 PM in the mountains on a cloudy day. The train looked pretty good going away, too. This train had a DPU, CP 8747. I was happy to bag both a westbound and an eastbound train at that location. 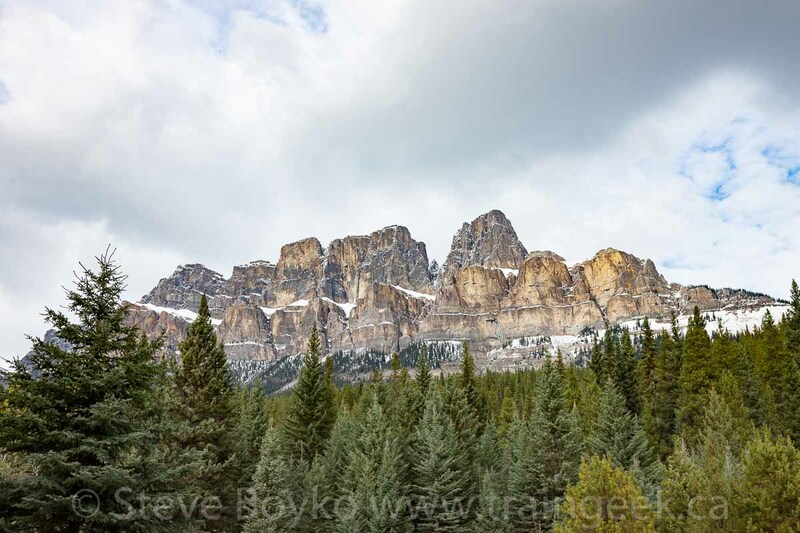 I packed up and we continued down the 1A / Bow Valley Parkway to Banff. When I started this series, I intended to have a post for every day of our trip. I'm breaking that "rule" now as we saw several more trains in the evening. This post is long enough, and the trains we saw were special enough, that I'd prefer to put them in another post. Coming soon... thanks for your patience. The rest of day 5 was spent in Banff, trying to photograph the Rocky Mountaineer. That didn't happen, but only because something better came along! PS you can read this series as an eBook, with extra photos and content! Field BC is my most favourite train watching spot ever. 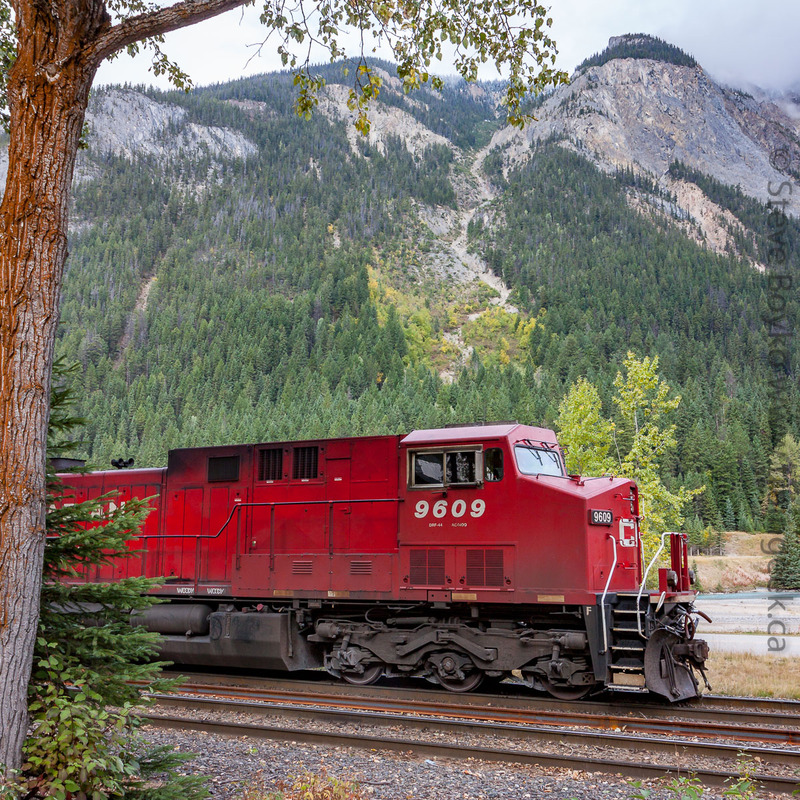 An endless parade of freights, a stunning mountain setting, what more could one ask? Bring a picnic basket, sit on the steps of the old telegraph building and enjoy! Your photos make me want to go back. Thanks, André - I love Field and I'll be heading west from there the next time I'm in the area.